A quick chat with WorkSource Woodburn representative Daniel Quinones is revealing; it's easy to understand how his friendly demeanor and competent comportment would provide solace to someone who just lost a job or is in need of finding one. Quinones beams when the conversation turns to success stories that he and his WorkSource cohorts have witnessed. The cheery and chatty longtime-Woodburn resident loves nothing better than to see people apply themselves and, often against the odds, succeed in what they seek. "America Aranda and I were just talking about this," said WorkSource Oregon/Oregon Employment Division supervisor Lori Bush. "We both thought of one word to describe Daniel: passion." "Dan is passionate about his work and truly cares for those he serves," said Aranda, also a WorkSource supervisor. "He never gets tired of listening, reaching out and helping Migrant Seasonal Farm Workers (MSFW) and really anyone we serve through WorkSource. He is one of the most knowledgeable people about programs and services in the community and seems to know everyone." 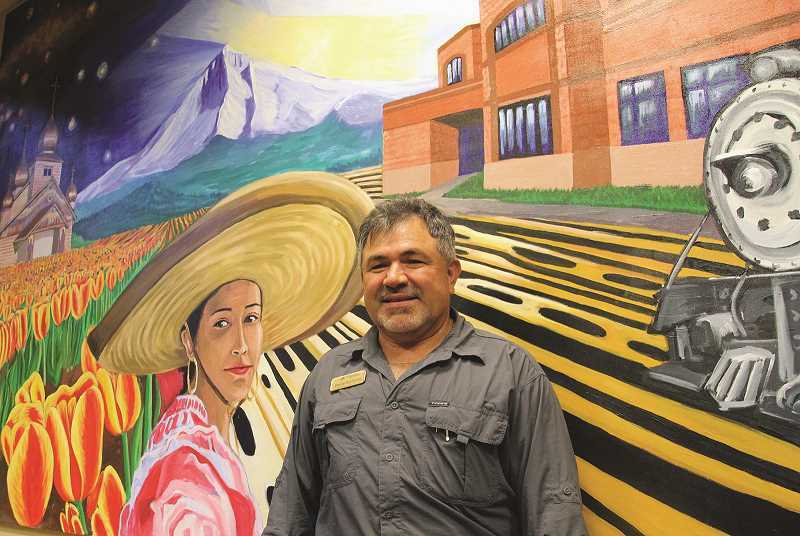 Originally from the U.S.-Mexico border town of McAllen, Texas, Quinones moved to Woodburn at a young age and was raised here, experiences on which he reflected recently in light of Hispanic Heritage Month, Sept. 15 to Oct. 15. Much of the seasoning, and perhaps a good share of the empathy, Quinones brings to his profession is rooted in his own experience. His title is Business and Employment Specialist MSFW /Ag Program Representative, and slices of his personal work history reflect the toils and tasks of area agricultural workers he serves. "I come from a farm-worker background and have seen the good and the bad in this industry," he said. "My parents were recruited in Texas to come work in the Willamette Valley in 1970. As most farm workers you have good experiences and bad experiences. Since, I was very young I always seemed to be helping folks out at one level or another, and today I still assist people who are dealing with some of the same issues we dealt with as farm workers in the '70's." He can relate to laborers and job seekers beyond the farm as well, having worked for Lonergan Oil, Willamette Industries, Oregon Human Development Corp (OHDC), and he was even self employed for a few years. When the Willamette Industries mill closed, the experience exposed Quinones to social work. He polished his skill set with studies at Clackamas Community College, Chemeketa Community College and finally Portland State University where he earned a certificate in Supervision and Performance Management. "I worked for OHDC Woodburn then went to Work for Oregon Employment Department for a 90-day position, and 28 years later I am still enjoying the work I do," Quinones said. Quinones' work not only serves farm workers but facilitates the region's overall agricultural industry, an industry in which Marion County ranks No. 1 among Oregon counties. Matching employees to the employers requires some unique supply-side nuances. "Migrant workers are very hard to track since most appear during the harvest season," Quinones said. "On a regular basis the Willamette valley has about 6,000 migrant workers working in various crops and during peak season, June through September, that number could increase to 15,000 or more depending on crop prices and amount of available work." Those workers are a critical resource for area agriculture, and area resources are critical for the workers. "Daniel is very familiar with all the community resources and is always assisting families with information and referrals for services as needed: child care, legal, housing, employment and training and health services referrals," said WorkSource cohort Frances Alvarado. "He is out in the trenches where the farm workers work and live." Quinones is quick to direct attention to his cohorts when he speaks of WorkSource successes. Included in that is when their guidance helps steer someone toward a diploma, college degree or certificate, often after overcoming disadvantageous circumstances. "When I worked for OHDC I had a young man (migrant) come to my office to seek training. His English skills were limited and he wanted to work with computers," Quinones recalled. OHDC enrolled the young man and sent him to take a placement test. They were apprised a week later that his English skills proved insufficient to pass the test. "I had to be the bearer of bad news since, this young man was my client. I let him know that his English language was not up to speed at that time," Quinones said. "He asked me to give him two weeks to retest." Quinones was cautiously circumspect, and tried to guide his client toward ESL classes. But the young man was adamant. "He told me all he needed was two weeks, and if I could agree to let him retake placement exam, he would pass it," Quinones said. He contacted the school, and school officials insisted that the client's level of English precluded him passing the test. Quinones relayed that to his client, who was still undeterred. So he arranged for a re-testing. "For next two weeks my client walked around with dictionary in hand. (He) learned English that applied to placement testing and spoke to as many people as he could in English to get his skills up to speed," Quinones said. "When the two weeks were up, I contacted school to set up retest for client and was warned that I might be setting client up for failure. "I again spoke to client and let him know what potential disappointment lay ahead, and he said 'I don't have a job, and I want to learn computers. I will have to pass this test.' He went and took test and passed." Quinones could not have been more proud. His client enrolled in classes, graduated and went to work with a computer company. When that company moved out of state, the young man enrolled at Chemeketa, received an associates degree in computer technology and is currently in charge of a national computer company's security. "This is just one of the success stories; the bigger story here is that his daughter graduated from Oregon State University as a mechanical engineer, and his son just recently graduated as a biochemistry major from the University of Oregon," Quinones said. Quinones added that he's encouraged to see a trend that shows many Woodburn students graduating from state universities or other places, including Ivy League schools, then returning to Woodburn to make a difference. "Some are teachers in our local schools, attorney's, bank executives, business owners, city council members, and state representatives," he said. The Hispanic influence on the area beyond the commerce is another point of pride for Quinones and many others of roughly similar backgrounds. "Migrant families who traveled to various states to harvest crops started to feel the impact that it was having on their children and stayed," Quinones said. "Woodburn has predominately been a welcoming city due to its agricultural base." He said Woodburn has been a destination for farm workers since 1940, and the city's recorded history mentions the Mexican Fiesta as far back as 1964, the year it became an official event. In January of 2017 the Oregon Heritage Commission met at the Capaces Institute in Woodburn and voted unanimously to include Woodburn's Mexican Fiesta into the registry of Oregon heritage traditions. A newsletter published by the Instituto de Cultura Oregoniana noted that the fiesta was originally an end-of-harvest celebration for the community to show gratitude to migrant workers and farmers. In 2010 it was named the Best Cultural Event in the state by the Oregon Festivals and Events Association. The newsletter reads: "The Fiesta Mexicana, which was originally sponsored by the Latin-American Club of Woodburn, became a seed that united the Spanish speaking people in Oregon. The event has a unique multilingual flavor." Quinones discusses other positive cultural and economical impacts delivered from the area's Hispanic population. "It is no accident that Woodburn soccer is recognized throughout Oregon and the United States; it is part of the contribution the farm-worker community has made to our great city," he said. "The Woodburn community has been growing each year since the mid '70's and seen continued growth until now from Latino families who have stayed in Woodburn." Quinones further noted that Woodburn retail operations that cater to migrant populations see an annual increase in business during harvest season. "While farm workers are in the local area they buy gasoline for their vehicles, rent houses, purchase clothing items and work gear for the season," Quinones said. "Farm workers also, dine in all areas of our city and acquire city services when housing is secured. Farm workers become part of our temporary Woodburn Community while here." Whether it's helping farm workers or celebrating the cultural variety of his community, what ties it all together for Quinones is a simple, meaningful word: home. "Daniel grew up in this community; he graduated from Woodburn High School (1979)," Alvarado noted. "He comes from a farm-worker family; they moved here originally from Texas and settles in this community many years ago. His brothers and sisters all attended school here as well and are all well-respected professionals in their chosen careers." Quinones wrestled at Woodburn High School; served as a Woodburn Fire Deptartment volunteer for 11 years; volunteered with Club Latino Americano, a Mexican Fiesta host; coached youth soccer; organized fire department softball tournaments; served on the Centro Cultural board, which held the Cinco the Mayo celebration in downtown Woodburn. where else would he want to live? "Woodburn has always been a welcoming city, and the small-town atmosphere is very appealing," Quinones said. "I grew up with Spanish, Russian and English (neighbors), and I always felt at home. Even now I can walk downtown or to our big retailers and see some of the folks I grew up with. A handshake and a hug from an old friend are still common practices."